Calabasas Truck Accident Injury Lawyer - Over 40 Years of Experience You Can Trust! Were You Injured in a Truck Accident or Car Accident in Calabasas? Our truck accident personal injury attorneys provide expert legal services for Calabasas, a city located in the Northwest San Fernando Valley region of Los Angeles County, California. If you were injured in a truck accident or car accident in Calabasas, or someone you know was injured, suffered any catastrophic injury or was killed in a truck collision and has a personal injury or wrongful death claim, please contact us now for an absolutely FREE CONSULTATION and please click here to learn even more about our truck accident lawyers and law firm. 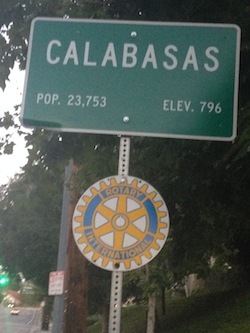 The city of Calabasas, located among Woodland Hills, Hidden Hills, Agoura Hills and Malibu, and known as the gateway to the Santa Monica National Recreation Area in Los Angeles County, is home to an affluent community of about 23,058 inhabitants and also the Law Offices of Gary K. Walch, A Law Corporation. 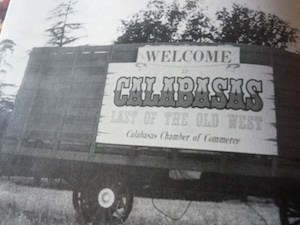 Derived from the Spanish name calabaza meaning “pumpkin,” Calabasas honors its namesake by holding an annual Pumpkin festival in October, which includes carnival rides, exhibits, entertainment and live entertainment. Visitors can hop on the free trolley and stroll on the streets of Old Town Calabasas for great eateries and small boutiques. You can also stop by Brandon’s Village, a universally accessible playground that serves over 5,000 special needs children from Calabasas and the surrounding communities. Famous residents include or have included Justin Bieber, Rod Carew, Ron Cey, Cameron Diaz, Derek Fisher, Jonathan Frakes, Steve Garvey, Kourtney Kardashian, the Kardashian Family, Lady Gaga, Lee Majors, Jennifer Lopez, David Hasselhoff, Howie Mandell, Lamar Odom, Ray Parker Jr., Wes Parker, Bret Saberhagen, Richie Sambora, Will Smith, Tori Spelling, Lindsey Wagner and Robert Walch. The Calabasas truck accident injury Law Offices of Gary K. Walch, A Law Corporation is composed of a compassionate, hard working group of experienced lawyers and individuals, representing its clients with the aim of obtaining the best possible result for its clients while making the legal process as easy and painless as possible. We invite you to click here to read about some of our interesting past cases and results and also testimonial comments from former clients. With over 40 years experience handling thousands of truck, car, motorcycle and other motor vehicle accident injury claims in Calabasas and throughout Los Angeles, the San Fernando Valley and California, over a 95% success rate and over $100,000,000.00 recovered, you can trust in our expert team of diligent truck accident injury attorneys determined to win your case. Calabasas City Hall with Emblem, City of Calabasas, Los Angeles, Calif.
We fight against insurance companies and work closely with your doctors’ offices to maximize your financial recovery. With our expertise in truck accident and personal injury law, our law firm is committed to aggressively pursue our clients’ rights and all appropriate remedies to further their best interests. Our dedicated truck accident lawyers and legal team strive to look out for our clients’ best interest over the long term so that our injured clients may obtain the best medical care, results and monetary recovery to move forward with their lives. Immediate assistance with medical care, doctors, specialists, physical therapy, property damage repair and settlement, advances, medications, prescriptions, etc. FREE consultation and NO fee until you WIN! Please call 1-866-INJURY 2 or 866-465-8792 to speak to an EXPERT accident injury attorney or just click here for our easy contact form. Our truck accident lawyers serve Calabasas and the entire state of California, all the way from Sacramento in the North to San Diego in the South. We offer a wide range of services regarding personal injury law, including, but not limited to, the following: car, motorcycle, truck, bus, train, bicycle and pedestrian accidents; hit & run, uninsured motorist (UIM) and underinsured motorist (UIM) accidents; premises liability accidents, including slip & fall and trip and fall claims; dog bite and dog attack claims; burn injury accidents; wrongful death claims; and other serious catastrophic personal injury accidents. While car collisions are the most common type of vehicle accident, truck accidents cause serious injuries, sometimes even catastrophic injuries and wrongful death fatalities, to the occupants of smaller cars, with 1 in 8 fatalities resulting from truck related accidents. According to a report from the National Highway Traffic Safety Administration (NHTSA), a total of 3,757 fatalities were caused by trucking accidents in 2011, with an estimated 88,000 injuries to all parties involved in "large" truck collisions. The damages caused by large trucks, known as “18-wheelers,” can be devastating and catastrophic for the individuals involved. What were the weather and road conditions? Did the driver of the truck or any car have low or poor visibility? Was the truck driver properly trained and licensed? Various other factors concerning the truck driver, employer and truck company. For example, some trucking companies offer financial incentives, which cause drivers to extend their hours, directly affecting their mental focus clarity. What is the applicable insurance coverage? Big rig trucks, often called “18 wheelers” and other types of commercial trucks are usually covered by larger commercial insurance policies, which cover the drivers and owners of these vehicles, oftentimes with much larger insurance policy coverage amounts than those policies for private automobiles. Larger policies covering trucks are necessary due to the more serious injuries and sometimes deaths that large trucks cause occupants of much smaller cars and motorcycles and also pedestrians. If anyone has been injured, immediately call 911 for an ambulance and/or paramedics. Do not move any seriously injured person on your own, as you may further exacerbate the injured person’s condition, unless it is absolutely necessary. Report the accident to the police. Call 911 to notify the police of the truck accident and your location. This serves as official documentation of the accident, which is sometimes required prior to obtaining insurance coverage, for example in Uninsured Motorist (UM) accident claims. 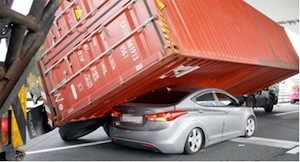 Do not move your damaged vehicle, unless it is necessary to do so. Investigators of the accident will want to piece together the details of what happened by looking at things like the location of the damaged truck, car and other vehicles, skid marks, tire tracks, debris, etc. Once law enforcement has arrived at the scene, be sure to communicate important facts and fully cooperate, so that the police may take down important details of the accident. However, even if you think you may have caused the collision NEVER admit fault as, among other reasons, there may be things that contributed to the collision that you may not be aware of such as the other driver being under the influence of alcohol (DUI), drugs and/or other intoxicating substances; excessive speed; defective parts or materials, such as brake failure, contributing to or causing the collision. If you have a camera, take pictures of the damaged vehicles, the site of the accident and any visible injuries. Remember, most mobile telephone also serve as a camera. Obtain all contact information, including the names and telephone number of all drivers, passengers and witnesses; the license plate numbers of all vehicles involved in the truck accident and remember to take down their vehicle identification numbers too, if available; the drivers license number of all drivers and personally copy down all information on their drivers licenses (never rely on someone else to read the drivers license information to you as they may make a mistake or intentionally give false information); obtain the other parties’ insurance information, including name of insurer and policy number; note all names and information printed on the exterior of the truck; etc. Notify your insurance carrier about the truck accident and prepare and file all required DMV forms (such as the SR1 and SR 19 forms used in California); and if you have an experienced truck accident lawyer representing you, ask you attorney’s office to handle all communication with the insurance companies, the DMV forms, etc. for not only your convenience but also to avoid making any disastrous errors. This is a service we are happy to provide for our clients. Just ask. If you do not have an attorney, please immediately consult with one of our experienced truck accident injury attorneys for an absolutely FREE CONSULTATION. All past and future medical expenses, including for ambulances, emergency rooms, hospitals, doctors and specialists, physical therapy, X-Rays and scans such as MRI and CT, psychological counseling, medications & prescriptions, and dental charges. All past and future loss of earnings and loss of earning capacity. This includes all time lost from work, even if one is paid for any of this time under sick leave or vacation time. Loss of enjoyment of life and the special activities you may have missed. All past and future pain, suffering, emotional distress and inconvenience. All property damage, rental charges and loss of use of property (as sometimes one cannot afford to rent a replacement vehicle, but still suffers from the loss of use of that property and, therefore, is entitled to compensation for this loss). All diminution in value of your property that occurs from a collision. That is the difference in value after your property has been repaired compared to its pre-collision value, which is usually more, entitling you to extra compensation for that loss. If you were involved in a truck accident or other personal injury claim in Calabasas or anywhere in Los Angeles, the San Fernando Valley or California, we offer an absolutely FREE legal consultation to discuss your truck accident, car accident or other personal injury legal matter, during which all relevant facets of your case will be examined and solutions presented on how best to proceed. With our legal assistance, you will be provided with experienced and attentive attorneys and a legal team who will be accessible to your needs. Our goal is to provide you with the best legal services and personal attention to resolve your problems as quickly as possible. We pride ourselves in obtaining excellent monetary recoveries for our clients’ personal injury claims and giving you someone you can always trust to call when you have a legal problem or question. With a strong and permanent attorney-client relationship, you will always have someone you can trust to call for any legal question or problem.